With your fingers, hold the upper eyelid up while pulling the lower eyelid down with the middle finger. Look up, and try to put the contact lens on the cornea of the eye. Even if you place it on the white of your eye, try to push it to the cornea along the lower lid margin. Now, slowly release the lower eyelid, and then, the upper lid. Repeat the steps again with the other eye. If you feel that your vision has blurred out just after you have put on the lens, do not panic. The reason might be just as simple as it has shifted off-center. You can try to put it back again to the correct central position by closing your eyelids and then massaging your eyelids lightly. If the problem persists, take the lens out, put it into the contact lens storage solution/multi-purpose solution for a minute and then try to put it into the eye again. It is always suggested that while you are inserting the lenses into the eye, you should have the lens container already filled up with fresh contact lens storage solution beside you. In case there is any problem regarding the inserting of the lenses, or you need to take out the contact lenses, this will make things easier for you. Prior to taking out the contact lenses, wash your hands properly with a mild antiseptic soap and dry them well. At first blink a few times. Now, with your face straight in front of you, look upward. With your middle finger, pull the lower eyelid down gently. Touch the lens and then slide it down to the white part of the eye with the finger. Continue to look up. While doing so, pinch the lens between your thumb and forefinger. Peel it off your eye and place it in the storage solution. If you face a problem while removing the contact lens, wet your eyes with artificial tear drops. After a few minutes, blink and make sure that the lens is moving freely in the eye. Now, try again to peel off the lenses from the eyes. If the problem still persists, contact your eye-practitioner for further instructions. Using contact lenses comes with a lot of responsibilities. Though these contact lenses give you the freedom to live the life you want, there are some basic caring tips you should never compromise on. Otherwise, you may end up causing permanent damage to your eyesight. Always remember a few do’s and don’ts when you decide that you are opting for soft contact lenses for your visual correction. After you remove the contact lenses from the eyes, put them in the storage/multi-purpose solution immediately. Saliva, tap water or any other non sterile or exposed solution should never be used to rinse or clean your contact lenses. It is strictly advised not to experiment with anything other than the recommended solutions for the lenses as it may not only harm the contact lenses, but also cause serious infections to your eyes. Use only the solutions that are approved by the FDA and manufactured by reputed companies. Also, before buying any contact lens solution, check the expiry date. Never use solutions that are not fresh and have expired. Before you start using any contact lens solution, read carefully the directions for use on the box. Before inserting or taking out the lenses, always remember to wash your hands with a mild soap and dry them using a hand-dryer or a lint free towel. Do not use any cosmetic products like cold cream, cosmetics, face powder or lotions before you handle the lenses. Always keep your finger-nails short and well-filed if you are a contact lens user. 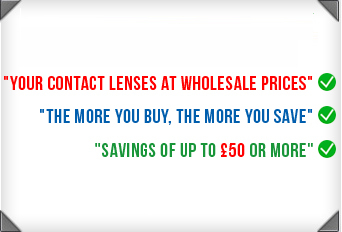 Otherwise, you run a chance of scratching and damaging the lenses as well as your eyes. Keep the lenses immersed in the solution completely when you are not using them. Use fresh solution in the contact lens case as well. Do not top up the remaining solution and change it everyday. Also, take care not to leave the contact lens case open. Follow the correct method of storing lenses. While using the lenses, if you ever feel any stickiness, discomfort or irritation in the eye, take out the lenses and consult your doctor immediately. There may be irritation or a burning sensation in the eyes in reaction to cleaning fluids, gardening solutions, chemicals or other environmental pollutants. In such cases, take out the lenses, splash clean water on the eyes and go to the doctor immediately. Remember, never ever delay the treatment, especially when it concerns something as invaluable as your eyes.